Olivia is a shopping theme. With Beautiful color, background image combination, elegant layout design. Olivia is a theme fully customisable. This theme base on Bootstrap version 3 to make fully responsive and PavFramework 2.0 with great tools to customize theme. Easy color customization with Variation Settings. Designed specially to boost mobile browsing experience. Mouse drag works great on desktop too! And supports most of the latest mobile devices available today. The theme comes up with more than 650 Google web fonts, PSD files. With powered by the framework the theme support you many great tools to customize theme via using Live Theme Editor, Auto loading custom css files support you creating unlimited of theme profiles without code very easy and simple. The Opencart Template included 3 schemes colors, great Layer Slider Module having 100+ Great Animation JQuery Effect, Google Fonts, Power Megamenu Module having great design Make Mega Column Tool and many other nice modules, ProductTabs Carousel using jquery owlCarousel version 2 with reponsive options. 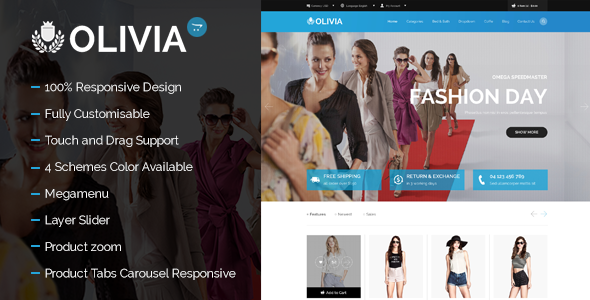 Item Reviewed: Olivia New Opencart Responsive Theme 9 out of 10 based on 10 ratings. 9 user reviews.